Boon | Beer Apprentice - Craft Beer News, Reviews, Interviews and Info. For today’s craft beer review I’m going to be sharing with you my experience in drinking a Boon Oude Geuze produced by Brouwerij Boon located in Lembeek, Belgium. I was really in the mood for something “sour” this evening and this Oude Geuze seemed like it might be the beer to do the trick. Let’s jump to the website, boon.be, and see if we can find some kind of description regarding this brew. Ready for a taste???? Me too!!! This beer came in a 12.7 oz. bottle and the label stated that it was 7.0% ABV. It poured a hazy, honey/gold to orange color. The collar was barely off white and of real good size. It was rather fizzy and soapy with some very large bubbles however. It didn’t stick around too long either and the lacing was only “so-so”. The nose started with a nice bit of that “funk”, “barnyard” and “horse blanket”. Hints of lemon citrus, sour green apple and sour white grapes. It also had very light hints of oak and minute tones of silage. Some tartness was accounted for, but overall, I didn’t think it was quite as acrid as some of the other Geuze/Lambics I’ve had in the past. The flavor began with an “ok” amount of tartness and sourness by way of some lemon citrus or lemon juice. White grape skins added a touch more sourness and a very light woodiness brought forth a diminutive herbal quality. A feeble amount of the “funk” was found. Again, not nearly as strong or forthcoming as I was hoping. Don’t get me wrong, I found nothing bad or off putting, but this brew didn’t seem to be as complex or intricate as I thought it might be. In fact, as I continued to drink, the flavor progressively got more weak and delicate. The mouthfeel was medium to medium/thin. It was fairly bright and dry with a good amount of carbonation dancing on the tongue. It did kind of remind me of a Champagne as the description mentioned. It presented a tad bit of a bite, however the flavor seemed to vanish rather quickly after each sip. 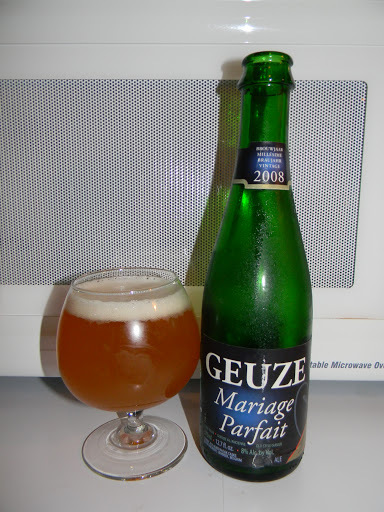 This was, for the most part, an average Oude Geuze in my opinion. It wasn’t horrible or undrinkable, although it wasn’t quite the best either. It just didn’t seem to have that “punch” or “kick” that I was really looking for. The aromas and flavors just seemed a little relaxed and subdued. It was, however, very, very easy to drink. I was able to down this thing with no problem whatsoever. Hey, don’t take my word for it. Try it for yourself. 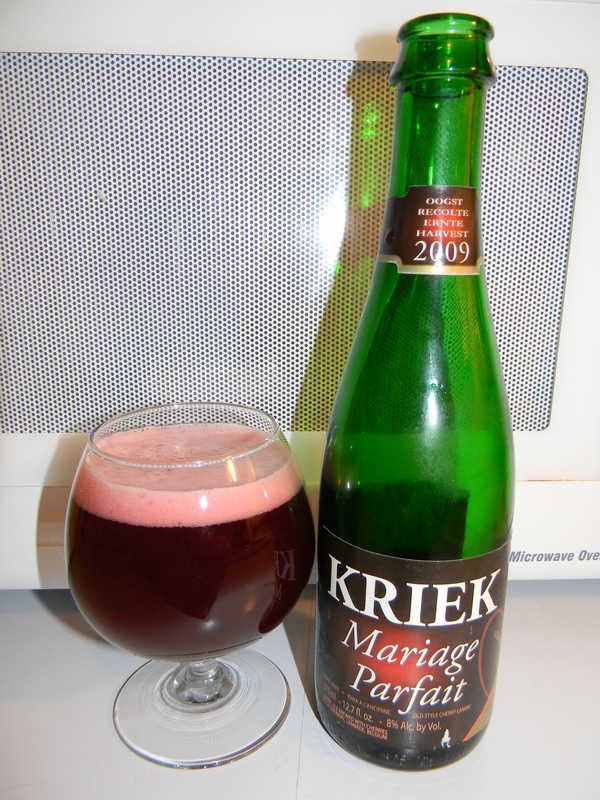 If you don’t favor the over the top sourness and tartness that these types of beers convey, but you are interested in exploring the style…. 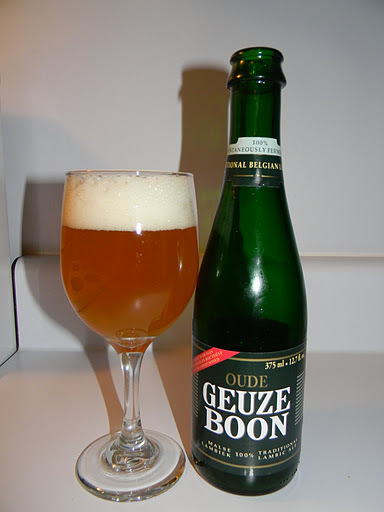 the Boon Oude Geuze would be a great place to start. It shows many of the proper characteristics without going completely berserk. Thanks for reading and commenting everyone. Feel free to drop a line and tell me what you think of the reviews.